Despite the heavy fog on the 9am whale watch on board the Cetacea we headed out towards the southwest corner of Stellwagen Bank. Very quickly into our search a whale appeared quite close to the boat. It was staying near the surface and we got good enough looks to think “that’s a small whale”. No sooner did we say that before mom arrived on the scene putting the 6 month old calf’s size into perspective! We spent the entire trip with Echo and her calf being entertained by the calf’s antics. This little whale hung around the boat while mom took longer dives, perhaps in search of food. We got some flipper slapping, tail slashes, rear behavior where the calf surface backwards, tail first rather than head first! All in all a great trip despite the less than perfect weather. 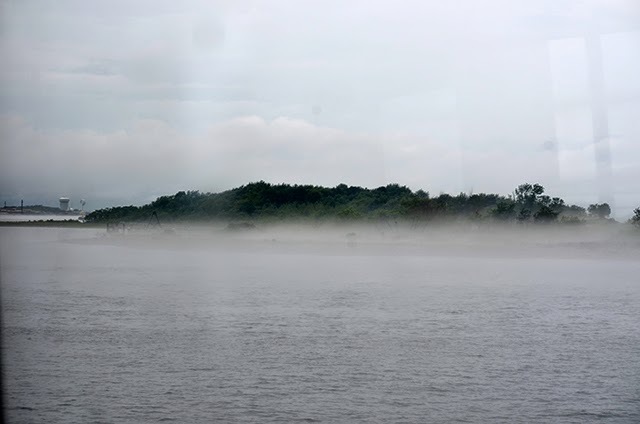 On the 1:30 trip on board the Cetacea we headed out again into thick fog towards the southwest corner. There is something magical that happens when you reach the southwest corner, the fog, which during the whole trip has been close around us, just opened up and gave us at least a half mile to a mile of visibility! Here we found whales upon whales moving in every direction. We identified Pele, Perseid, Apex, Storm, Pepper, Ravine, Pumba and three mother and calf pairs, Nile and calf, Tornado and calf, and Milkweed and calf. We also spotted a new whale for the season Canopy, who also looked to be accompanied by a calf. We got some great close approaches and breaches from some of the calves with amazing looks everywhere. The birds were also in high numbers with every type of shearwater, Wilson’s storm-petrels, and gulls absolutely everywhere. Today on board the Asteria, we traveled to the Southwest corner of the bank in the pouring rain. 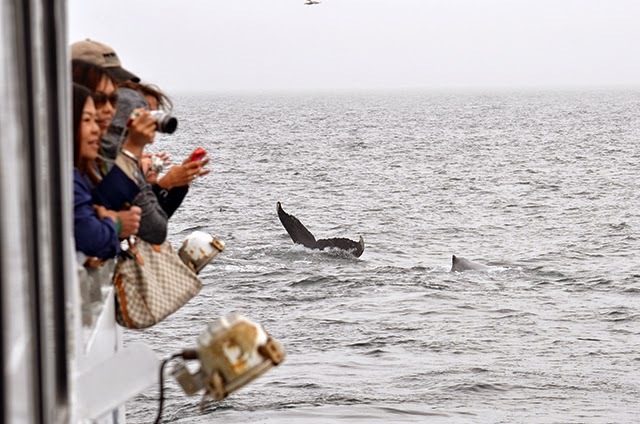 Even though we had less that 1 mile of visibility, we still found whales. 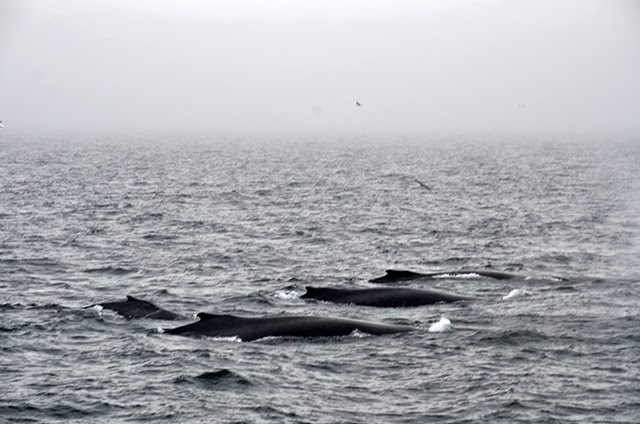 Four humpback whales: They don't mind the rain! We had started by traveling towards the location of the 9am whale watch, but found lots of humpbacks before reaching that location. We had a 3 groups of scattered humpbacks; 5 whales (2 mom and calf pairs with one adult), 2 humpbacks, and 2 other humpbacks. We spent most of our trip with the group of 5; Tornado and Calf, Octave, and 2 unknowns. They were taking short dives, about 4-5 minutes, and were traveling. 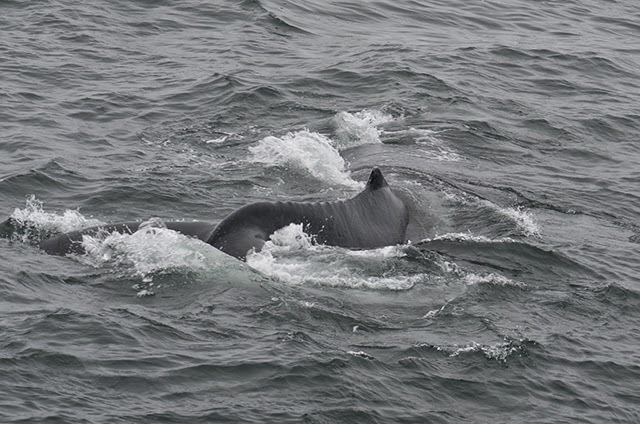 See attached photo of Octave’s left dorsal and of the group traveling. We then spent some time with one of our pairs, Pele and Pumba. This group was also taking short dives and traveling. Both Pumba and Octave are new sightings for us this season! Today on the Aurora we headed out in the fog once again to the Southwest corner of Stellwagen Bank. 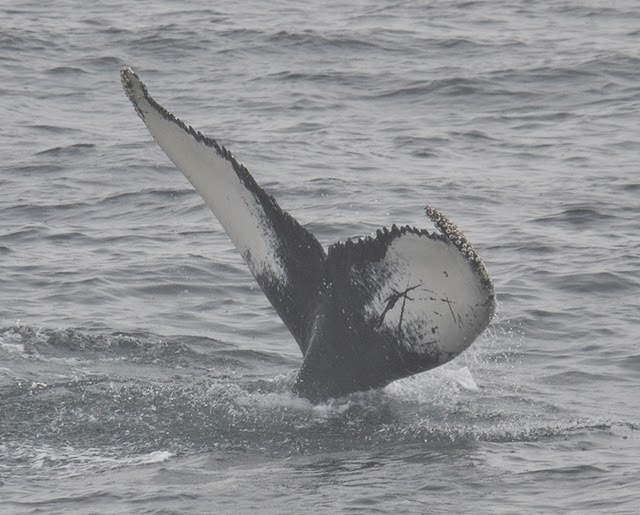 Our trip began with a very elusive humpback. We haven’t been able to get an ID just yet because I was only able to get a photo of half of its left fluke. 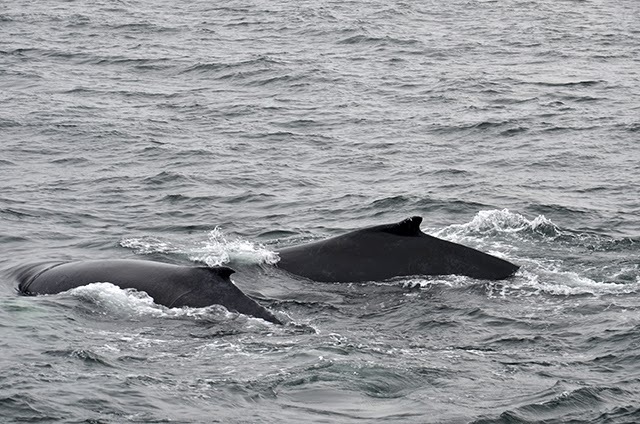 We continued a bit further and found even more humpback whales randomly traveling in groups. There were many splits and joins today with groups ranging from 2 to 5 whales! Throughout the day there were between 8-10 whales in the area. We were able to ID Octave, Canopy, Bayou, Pivot, Milkweed and calf and Tornado and calf. 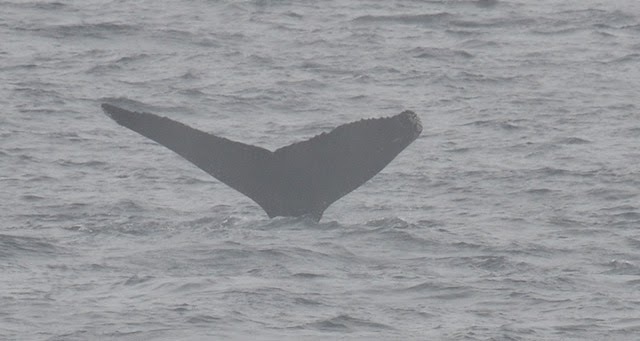 It was a very exciting day jam-packed with humpback whales as well as many sooty and greater shearwaters! Another foggy, yet successful day out on the water!